candidates apply online from 14-December-2017 to 29-December-2017 through official website of UPPCL @www.UPPCL.org. 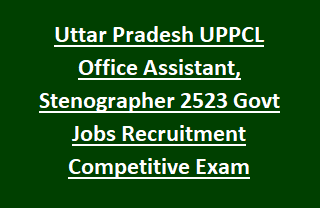 This Stenographer, Office Assistants recruitment of UPPCL will be conducted through typing test on computer, written exam and personal interview and two stages. See the below-given information for available vacancies, written exam pattern, syllabus, typing test details, important dates, age limits, admit card details, educational qualification, and online application procedure for UPPCL Stenographer(Ashulipik) Office Assistant (Karyalay Sahayak) general recruitment 2017. The candidate's age limits as on 01-July-2017 is 21-40 Years. For SC/ST 5 years of age relaxations are given and OBC candidates 3 years of age relaxation is given. Selection for this UPPCL Stenographer, Office Assistant recruitment will be held based on common objective type multiple choice written test and typing test. For Office Assistant posts written test will conducted for 200 marks. Written Test will be in two parts. Part 1- 50 Marks-DOEACC "CCC for Office Assistant" will be given. Part 2-Will be conducted for 180 marks. There is a 0.25 negative mark for each wrong answer. Part 1- 50 Marks of DOEACC "O" Level paper for Stenographer will be given. Typing speed should be 60 wpm in English and 30 wpm in Hindi. For General and OBC candidates examination fee is Rs.1000/- and for SC/ST Rs.700 and for PH candidates examination fee is Rs.10/-. Click here to apply online for the UP POWER CORPORATION LTD Stenographer, Office Assistant Recruitment 2017. Click here to see the official notification of UP POWER CORPORATION LTD Stenographer (Ashulipik) Jobs Recruitment. Please share this UPPCL notification with your friends and if you are looking for any job-related information feel free to Comment below we will respond you in time.